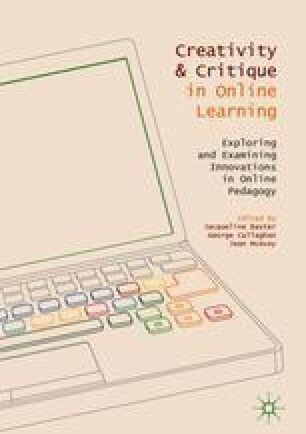 This chapter introduces the context in which online teaching takes place within Higher Education (HE). It begins with an outline of the political and economic climate, moving on to describe neo-liberal discourses that are influencing and affecting teaching staff and students. We then take a diachronic look at the ways in which new innovations have been received throughout history, before moving onto the realities of teaching and learning online. Examining the role of academics in online teaching leads into a description of the particular context of The Open University and the evolution of its teaching and place in HE. Davies, S. R., & Bartholomew, P. (2017). How does technology -enhanced learning contribue to teaching excellence ? Digifest Birmingham Online at: https://www.jisc.ac.uk/digifest. Accessed 10 Oct 2017. Dewey, J. (1916). Democracy and education. Pennsylvania State University. http://library.um.ac.id/images/stories/ebooks/Juni10/democracy%20and%20education%20-%20john%20dewey.pdf. Accessed 24 Aug 2016. Lee, J., & Martin, L. (2017). Investigating students’ perceptions of motivating factors of online class discussions. The International Review of Research in Open and Distributed Learning, [S.l. ], 18(5), ISSN 1492–3831. Available at: http://www.irrodl.org/index.php/irrodl/article/view/2883. Accessed 25 Aug 2017. doi: https://doi.org/10.19173/irrodl.v18i5.2883. Open University. (2016). Annual report. http://www.open.ac.uk/about/main/sites/www.open.ac.uk.about.main/files/files/ecms/web-content/about-annual-report-2015-2016.pdf. Accessed 7 Nov 2017. Weller, M. (2011). The Digital scholar: How technology is transforming academic practice. Bloomsbury Open Access. https://www.bloomsburycollections.com/book/the-digital-scholar-how-technology-is-transforming-scholarly-practice/. Accessed 7 July 2016.